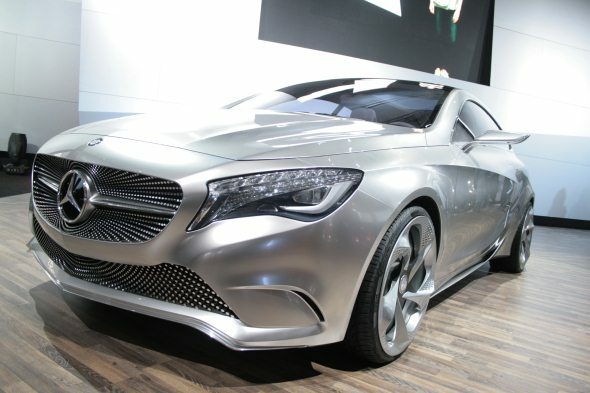 Mercedes A-Class Concept at Auto Expo 2012! Today, Mercedes-Benz India showcased the A-Class concept at the 2012 Delhi Auto Expo. It holds the promise of being a more affordable Benz at Rs. 15 lakh-plus and confirms with the trend of luxury car makers launching affordable cars for Indian market. The A-Class concept is a low-set, coupe-like and radically styled as against the tallboy designs of the present A-Class production cars. The A-Class concept gets design cues from wind, waves and aviation engineering. It’s resemblance to SLS AMG, CLS models is evident from the sporty wide gap front grille and large Benz logo at the centre. The ornamental headlamps with two rows of LED lights and sharp-looking, deep-set headlamps may not make it into the production version. The rear of the A-Class concept however, gives the impression of a crossover largely because of the thick C-pillar, protruding boot lid design and widely peeled out tail lamps that accentuate the width of the car. The A-Class concept is powered by a new range of turbo-charged 4-cylinder petrol engines mated to a dual-clutch transmission. The top-of-the-line engine is the 2.0 litre turbo motor that puts out 210 bhp of maximum power. The engine is transverse mounted in order to reduce the car’s nose. The A-Class concept is equipped with a radar-based collision warning system (first in its segment) and adaptive Brake Assist. Mercedes-Benz has a detailed analysis of accident related data and thus made the radar-based collision warning system that can help prevent roughly 20% of all rear-end collisions and lessen the severity of a collision by a further 25% with the A-Class concept. 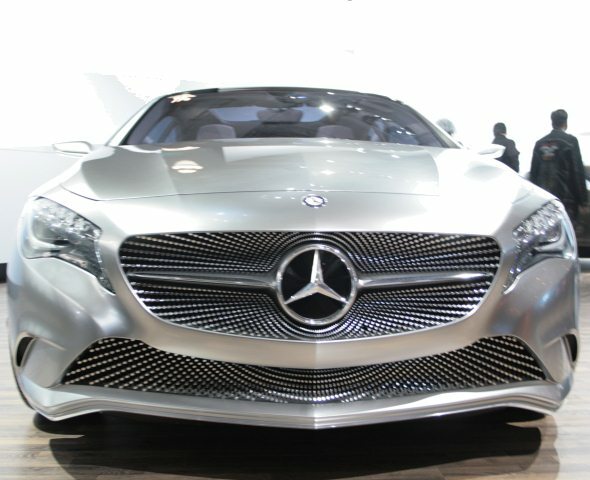 Mercedes-Benz India has had very successful 2011 with a sales growth of 31% when compared to the sales in 2010. The company sold 6,698 units in 2011 as against 5,110 units in 2010 during the January – November period. The unveiling of the A-Class hints that the production version of the car may be launched by the year end or in early 2013. The A-Class has to compete with the BMW 1-series and the Audi A1. Except for the BMW 1-series, the other two cars are in the concept stage and yet to hit production line. Hence, the A-Class, if launched earlier than its rivals, will get the first starter advantage! « Tata Safari Storme launched at Auto Expo 2012!